Having written about the medieval jester and medieval juggler recently, I became fascinated by the subject and came up with the idea of doing an interview with a modern day medieval jester. If only I could find one! Then the idea came to me .... about a year ago, someone had contacted us with a polite request to use one of our copyright images for their own purposes. 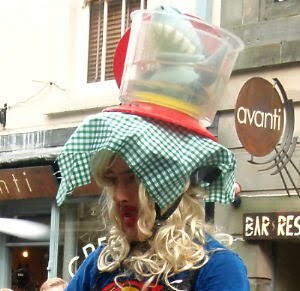 In the communications that ensued I discovered that the request had come from a professional street entertainer - a highly skilled juggler called David Ford who sometimes peforms as a medieval jester and juggler. That was it ... I checked out his website and sure enough, he was the ideal candidate for my interview. 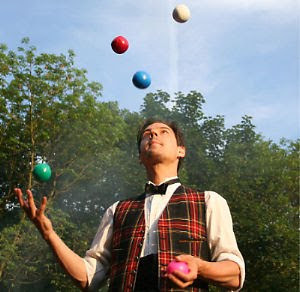 However, I needed to make the interview interesting so before I compiled a list of suitable questions for Dave I did some reading up on the subject - everything from contact juggling to bounce juggling and juggling notation. It proved a fascinating 'journey' of discovery. I'm delighted to say that Dave answered all my questions and even furnished some super photographs of him in performance for me to use in the page. Thank you Dave - I especially like the underwater juggling in defiance of the shark! David even does a medieval jester double act with talented performer Micky Bimble. So sit back and enjoy reading about this highly skilled modern medieval jester and juggler. Did The Medieval Jester Juggle? Taking The Biscuit - Medieval Style!